Copperhead, a graphic novel by Jay Faerber & Scott Godlewski is quite possibly the best new series I’ve read this year. 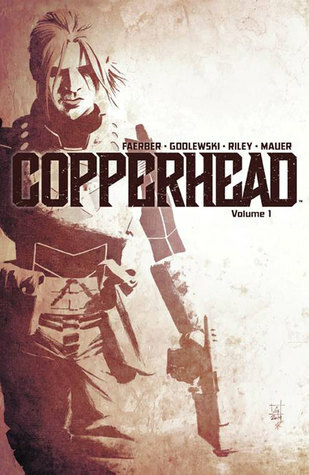 Part science fiction, part western, part mystery/detective story, Copperhead manages to blend the different genres together nicely to create an engrossing story that we just want to keep reading. But what works for this series, is not the location and the oddness of the planet, or even the mysteries so far. It is the characters. Author Jay Faerber has given us just the right amount of information and personal intrigue in each of the characters introduced to date. Our hero (heroine) is Sheriff Clara Bronson, who, along with her son Zeke, have come to the backwater mining town of Copperhead on the planet Jasper. She’s been giving the job over the long-time deputy in the town, a giant of an alien who was part of a war at one time. Bronson doesn’t have much time to get settled when she responds to a domestic disturbance call that gives her a little more than she bargained for. And when a town’s big-wig is put off by her abrupt and lack of cow-towing manner, we learn that Clara might be running away from another problem. This story moves along at just the right pace…we don’t spend pages and pages on non-essential story just to pad a comic book with enough panels to sell an issue, and we don’t jump randomly from story-line to story-line trying to be clever (both have been problems with graphic novels I’ve read). These story-lines develop well and integrate nicely into what appears to be a much larger story arc. The art is fantastic. Again, some of the best graphic novel art I’ve seen now. It is rich, detailed, and consistent and that’s what I want in an on-going comic book/graphic novel series. I don’t want to have to guess who the drawings represent. And I don’t want to have to turn on a sun lamp to make out the art in some gloomy setting. This art suits the story perfectly. I really want to know more about ALL these characters and I can’t wait to see how each of them develops and how they interact with one another. This book was a real unexpected pleasure. It is why I enjoy reading ARC’s for review … to find gems like this and to let you know about them! This is highly recommended! Looking for a good book? Copperhead, Vol. 1 is a sci-fi graphic novel with a western theme with superb characters and intriguing mystery and you don’t want to miss it.